In 2015 was produced yacht Jeanneau Cap Camarat 7.5 WA named Blue Pill. This yacht is placed in port Pula in the area of Istria in Croatia. You can board up to 2 crew members on the yacht Blue Pill. Layout of berths is 2 (8 persons). There are 1 cabins situated under boat's deck. Blue Pill has 1 toilettes with showers. 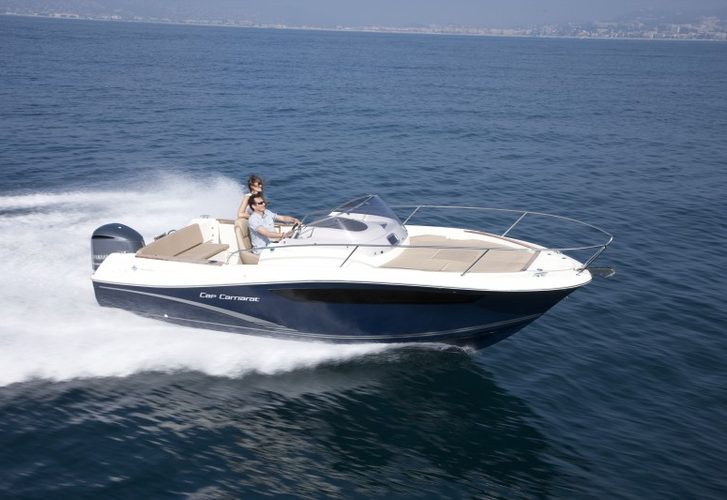 Search for different boats by moving to this section: Motorboats Istria. Tank for fuel is 140.00 l l. capacious , water container has up to 320.00 l liters. In this yacht is applied engine 300 HP Yamaha 300. With 7.42 m of lenght overall and 2.54 m of width Blue Pill provides enough space for comfortable sailing. Jeanneau Cap Camarat 7.5 WA Blue Pill is equipped with: Bimini top, Electric fresh water pump, Internet Wi-Fi, Mobile phone (netted). . Nonrefundable deposit has value 750.00 EUR. Get more more boats by going to the section Motorboats Pula.